AKNUCET Nannayacet 2018-2019 online application form : AKNUCET NANNAYACET 2018 Online Application Opened at aknudoa.in. 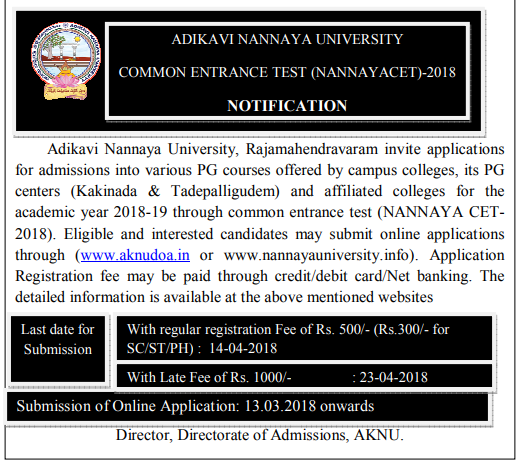 Adikavi Nannaya University Rajahmundry has issued Common Entrance Test (AKNUCET 2018 Notification released on 09th March 2018. Adikavi Nannaya University invites Applications in the prescribed proforma from the eligible candidates (who have passed or appeared for the final year examination in the qualifying Degree) for admission through Adikavi Nannaya University Common Entrance Test (AKNUCET-2018) into the following Courses offered by the University Colleges of Adikavi Nannaya University for the academic year: 2018-2019. The eligible candidates can register in online before 14th April 2018 with a fee of Rs. 500/-(Rs.300/-for SC/ST/PH)). The online application will available at Adikavi Nannaya University http://aknudoa.in/Default1.aspx?cet=AKNUCET. Applicants who have already obtained their UG degree or are appearing for their final semester exam are eligible to apply. Admission into the PG Arts and Science courses at AKNU only if they have a three-year Bachelor Degree of pattern, with the required minimum percentage of marks by AKNU. Candidates who have got a Bachelor Degree in Distance Education without 10+2+3 pattern are also eligible for admission into P.G. Courses, provided they submit a residence certificate. Bachelor Degree of B. A/ B.Sc./ B. Com/ B.Litt. and B.L from Universities other than those in the state of Andhra Pradesh is acceptable provided Govt recognizes them. The eligibility criteria are specific for each subject. Given below are the test codes for each subject that one can apply for AKNUCET. Second Step: Search for the “NANNAYA CET-2018 Online Application” click on to that. Third Step: Select right side box Instructions to fill Online Application, Admission Information Brochure, Registration, “Online Payment,” and Print Application. Read all information for submitting the online application. Fourth Step: Here the direct link to Submit the online application for AKNUCET NANNAYACET. Last date for submission of online Applications(with a regular registration fee of Rs. 500/-(Rs.300/-for SC/ST/PH)): 14th April 2018. With late fee of Rs.1000/-(Regular fee Rs. 500/- + Fine Rs. 500/-): 23rd April. Commencement of Entrance Tests: 07th May 2018. Submitting online application candidates carry all these documents. Provisional certificate of the qualifying degree examination. Otherwise, a xerox copy of hall ticket if the candidate is either appearing for final year degree examination or awaiting for result. Proof of Date of birth (SSC certificate) and Adhar Card. Proof of claims of reservations under SC, ST, BC [A/B/C/D/E], PH, NCC, Sports and Children of Armed Personnel (CAP). Three self-addressed and Rs 5/- stamp-affixed envelopes and A Self- addressed postcard for acknowledgment.